They met at the Safe Adventure Caffè and despite the fuzzy warmth of the dining room, their mood was sombre. Skratch the Cat knew he was expected to ask the question so he did. "What was that for an epic adventure?" "Dangerous and uncertain," frowned Lapinette. "Like life," observed Wabsworth. The Wabbit had been waiting. "I simply cannot instruct you to be on this next mission. I need volunteers." "I think there's a queue," said Skratch. 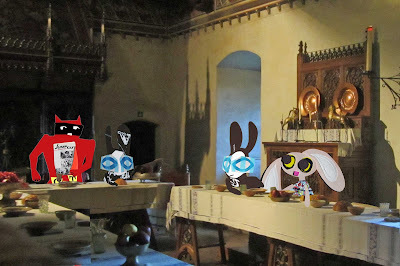 The Wabbit managed a half smile while Lapinette spoke softly. 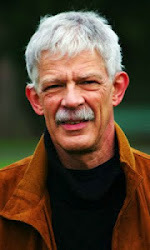 "Where love is concerned, it's not a matter of volunteering." 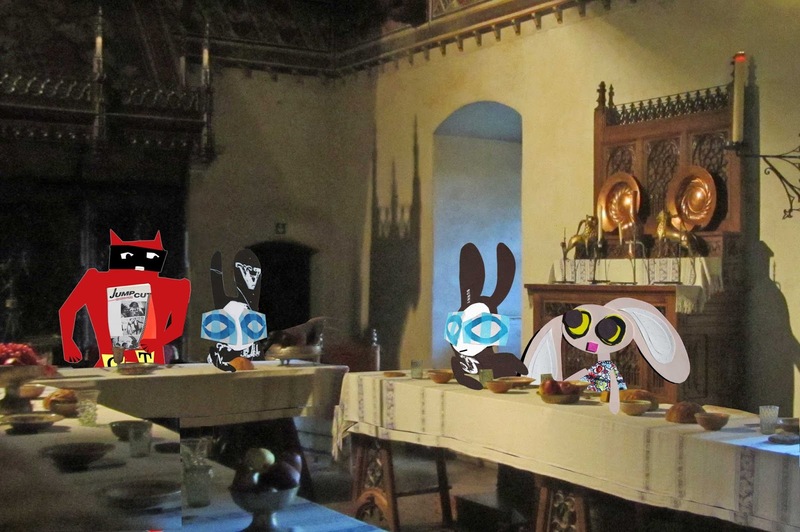 They listened to plates and cutlery rattling in the kitchens and the Wabbit sniffed. But food aromas failed to mask the scent of menace. "So who's on board this mystery train?" Wabsworth took a list from his fur. "Everyone we have." "I told you so," said Skratch. The Wabbit nodded but it was a question. "Intel?" "Slight," said Wabsworth. "Cloaking technology?" asked the Wabbit. 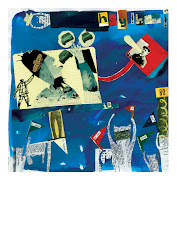 "Purely optical, but in place," replied Wabsworth. "Location?" asked the Wabbit. "Hypothetical," said Wabsworth. The Wabbit sighed. "It'll have to do." Wabsworth grinned. "We have isotope signatures from the Murmurants." The Wabbit thought long and hard. "We will appear as tourists." Wabsworth searched for a camera. Skratch guffawed and looked aimlessly around. Lapinette fidgeted for a map and drawled, "Kin you point me to the centre of town?"